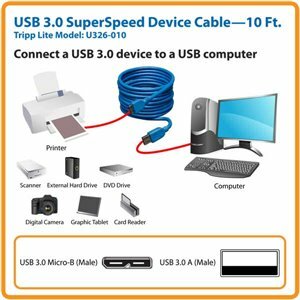 Tripp Lite's 3.05 m (10-ft.), USB-A to Micro-B SuperSpeed USB 3.0 cable brings significant performance enhancements to the ubiquitous USB standard, while remaining compatible with the billions of USB enabled devices currently deployed in the market. SuperSpeed USB will deliver 10x the data transfer rate of Hi-Speed USB, up to 5Gbps, as well as improved power efficiency. USB 3.0 utilizes a bi-directional data interface rather than USB 2.0's half-duplex arrangement, where data can only flow in one direction at a time, giving a ten-fold increase in theoretical bandwidth. Don't settle for inferior workmanship or performance! This Tripp Lite USB 3.0 SuperSpeed Device Cable assures that you get maximum performance from USB devices over long distances. Unlike cut-price cables, the U326-010 is manufactured to exacting specifications, using superior materials, to deliver full USB 3.0 performance for multimedia and other high-end applications. And we back our pledge of quality with a lifetime product warranty. This genuine Tripp Lite USB 3.0 A/Micro-B SuperSpeed Device Cable is the choice for superior performance, providing full USB 3.0 performance for multimedia and other high-end applications. Use it to connect high-speed USB 3.0 devices such as printers, scanners, external hard drives and external DVD players to a USB computer up to 10 feet away. The U326-010 provides USB 3.0 A (male) and USB 3.0 Micro-B (male) connectors. It meets or exceeds USB 3.0 specifications and is backward compatible with older USB 2.0 devices. With its superior design and construction, the U326-010 is ideal for multimedia and other high-end applications that require fast, clear transmission, free of line noise and other interference, over long distances. It supports faster data transfer rates (5 Gbps), and is backwards compatible with USB 2.0 for both low-speed and high-speed devices. USB 3.0 SuperSpeed uses 1/3 of the power of USB 2.0 to transfer the same amount of data. Conversely, during charging applications, the U326-010 delivers twice the power of USB 2.0 for faster device charging. The U326-010 has lower active and idle power requirements, and does not require device polling. The U326-010 is manufactured using top-quality materials to assure maximum performance. Nickel-plated connectors with gold-plated copper contacts assure superior connectivity. Premium double-shielding cables with tinned copper braid and aluminum Mylar foil minimize signal interference. Molded connectors and integral strain relief assure durability and long cable life. A flexible PVC jacket makes the U326-010 easy to install, even in tight corners and other areas where space is restricted. When you choose this genuine Tripp Lite cable, you get superior performance plus peace of mind! We're so confident of the quality of the U326-010 that we warrant it to be free from defects in material and workmanship for life!